Purchase this product now and earn 2,705 Reward Points! 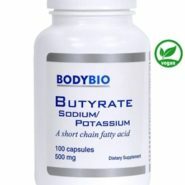 Butyrate is a short chain fatty acid (SCFA) that has been combined with sodium. 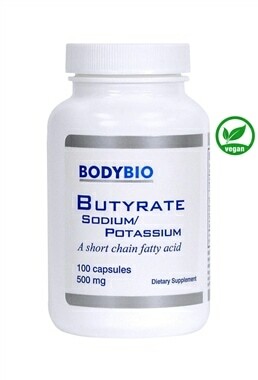 Butyrate is made in the lower colon by bacteria and taken up by the colonocytes, the cells that line the colon. It then becomes an important food for those cells. Lacking good bacteria in our colon, such as when we take antibiotics, can lead to an insufficient supply of butyrate. What is Sodium Potassium Butyrate used for? How would a person know if they should take Sodium Potassium Butyrate? Butyrate is used in a wide array of neurological disorders. The research reports it’s ability to elevate cellular enzymes such as alkaline phosphatase and low sodium and chloride levels. However these are analytes (cellular enzymes or electrolytes) from a blood test which many individuals have doe yearly. It’s difficult to pin point when you may need Butyrate, however, your health care practitioner (HCP) should be able to assist you. Why would one take Sodium Potassium Butyrate instead of plain Butyrate? Vise Versa? Calcium and Magnesium Butyrate is the most popular since we all seem to be in need of those two electrolytes. However, there are some individuals who are Sodium and/or Potassium deficient. Your health care practitioner (HCP) could certainly assist those who may fall into that category. What is the recommended dosage of Sodium Potassium Butyrate? Approximately 2-3 caps twice daily, unless otherwise suggested by a health care practitioner (HCP). How long will 1 bottle of Sodium Potassium Butyrate last? It depends on how many you take daily – it comes in 100 count bottles. Can Butyrate be taken on an empty stomach? We have never heard of any problems taking Sodium Potassium Butyrate on an empty stomach, or at any time. We have reports of some who find it helpful to take before bedtime as a sleep aid. Sodium Potassium Butyrate contains Butyric Acid, Potassium Hydroxide, Sodium Hydroxide, and medium chain triglycerides. Are there any side effects from taking Butyrate? None to our knowledge. None reported.